Kids' Book Review: Review: Shhh! Don't Wake the Royal Baby! Review: Shhh! Don't Wake the Royal Baby! Oh my goodness. What a hullabaloo. And I don't mean The Great Kate Wait the world has experienced this month, in anticipation of a new royal tot, and the subsequent media frenzy at the arrival of their beautiful son on 22 July. This brouhaha is coming from the Royal Palace, from a cot in the royal nursery, from the throat of a royal baby--waaah! waaaaah!--proving once and for all that sleep deprivation affects us all, blue blood or no! The Duke and Duchess are beside themselves. The Duchess tries rocking but as soon as she puts baby down again--waaah! waaaah! The Duke tries a helicopter ride (us mere mortals use the car) but no joy--waaah! waaaah! Even the ancestral golden royal dummy doesn't work! There's only one person who can solve this dilemma. It's HRH the Queen, of course. Snaffling the wee baby, she pops off to the royal plane, straps herself into the parachuting gear she used for the Olympic Games opening ceremony, and takes a flying leap, her grandchild strapped securely to her chest. Of course, as she gently floats to the ground, guess who falls asleep? 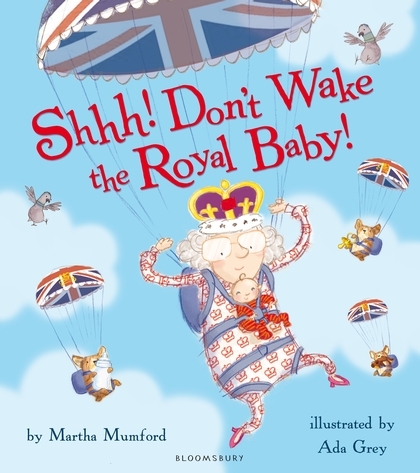 This gorgeous, funny book is not only a royal treat for monarchists ... those who ticked the Yes box on the Republic referendum form will also find Mumford's tale a load of regal fun. Luscious illustrations are a real delight, and what I love most about them is the blending of traditional elements with a more modern take; for example the fact that the wee baby wears a super groovy striped romper. Featuring cameos from extended royal family such as Prince Harry and Pippa Middleton (who set about preparing a lavish party for the baby's recent arrival) both kids and adults will readily relate to the chaotic but blessed arrival of a newborn child. Congrats to Will and Kate from KBR. Title: Shhh! Don't Wake the Royal Baby!